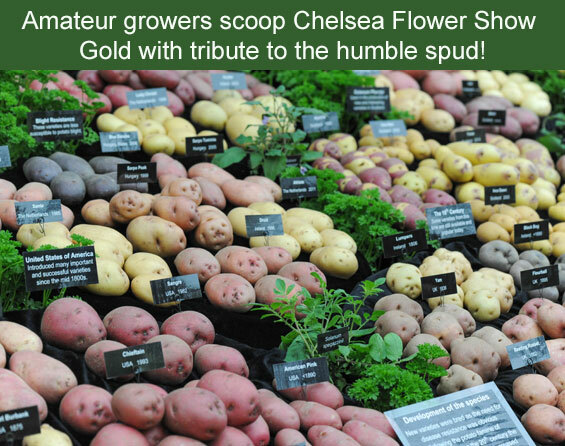 A Great Pavilion exhibit without a single decorative bloom on show has charmed judges into awarding a Chelsea Gold Medal to Scots potato aficionados Morrice and Ann Innes – the first gold to be awarded to a potato-only display in the show’s 150 year history. The Potato Story, sponsored by Thompson & Morgan, acts as a simple showcase, highlighting more than 140 varieties, and traces the history and origins of the potato while drawing attention to its diversity and versatility in the garden and kitchen. Morrice of Old Town, Aberdeen, claims to have the largest private collection of potato varieties, built up over 20 years, and has long championed his favourite vegetable. Many of the display’s varieties come from Morrice’s own collection of tubers, and include original South American species as well as historical European heritage varieties such as Karaparea, which was taken to New Zealand by Captain James Cook in the 1770s. The exhibit is completed with modern varieties grown from Thompson & Morgan seed potatoes, including blight resistant main crop Sarpo Axona and its latest introduction, high yielding salad potato Jazzy, currently the mail order supplier’s best seller. If only we could persuade the supermarkets to stock a greater range of potatoes! With so many varieties in existence, it seems a bit wet that the supermarkets just label them “red” or “white”. I think that most people would only be able to name about 3 or 4 varieties – probably King Edward, Maris Piper, Charlotte, and Jersey Royal! ← Plant fairs, Pom Pom flowers, Pests and Perfect Tarts!